Two weeks ago, I was waiting. Waiting for the forsythia to bloom. I do not always wait well. Truth be told, more often than not I do not wait well. In fact, I usually quit waiting. I give up and, if I’m honest, sometimes I even forget about the very thing I was so eagerly anticipating. Like the forsythia. For several mornings, I would check for even the earliest hint of the yellow blooms. For just the buds to be full and close to breaking open. But after several mornings and no sign of change, I stopped looking. And then really forgot about the bush altogether. 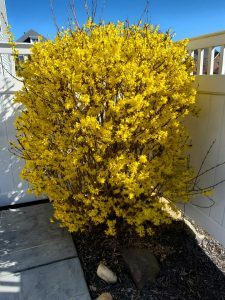 It wasn’t until my husband asked, “have you seen the forsythia?! ?” that I realized my favorite harbinger of spring had not only budded but was covered in color!! Of course, now I am enjoying the sunny yellow flowers. But I missed the joy of seeing it first open and watching each day as it became fuller and fuller with color. I missed the full experience because I failed to keep waiting. To keep expecting and anticipating. I wonder how many other times I have missed the full blessing – blessings much richer than the joy of spring flowers -simply because I could not, or would not, keep waiting? I ask God for something. I even anticipate that He will answer and, by His grace, I enjoy the blessing of an answered prayer. But what did I miss in those days, weeks or even many months leading to the answer? There is much to learn, to glean and even to enjoy in the waiting for the answer. Sometimes we can see God working and moving. And that is exciting. Sometimes, He even allows us to be part of the process. There are, of course, times that it seems nothing is happening….that God is not working or, at the very least, there is not going to be an answer. But, so often, the truth is the waiting itself is what God wants to use in order to bless us. Those are the blessings that I often miss. James 1:4 reminds me: “But let patience have her perfect work, that ye may be perfect and entire, wanting nothing.” He perfects me while I wait. Refines me. Matures me. I don’t want to miss that. What answers are you waiting for? What blessings are you looking forward to? Don’t quit anticipating? Keep asking and keep watching. And “count it all joy” – enjoy!! – even the waiting. I love when the forsythia blooms! I have a few bushes in my yard and they’re so bright and cheerful. We need this after a cold dreary winter. I’m glad God can bloom in any season! Thanks for sharing this; it’s hard for me to wait patiently too. Yes, we must learn to enjoy the wait. I am waiting for all kinds of things. 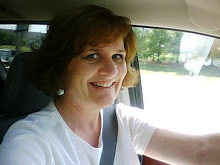 At first, I stopped enjoying the journey but now I try to find joy along the way. Thank you for your wisdom here and I love the blooming Forsythia. Isn’t it wonderful to find the joy all along the way – even during the waiting?! Reminded me of when we planted forsythia twigs as a property break many, many years ago. I visited the old house a couple of years back and those forsythia bushes were vibrant! I also appreciate the lesson on waiting! Those forsythias are invincible showstoppers!! Next Post Do I Measure Up? ?